The Noizoids have invaded the planet Melodia and kidnapped Princess Ariana of Symphony City. You are Tempo, a warrior chosen to wield a mystical, musical staff. Cross the musical kingdom and battle the Noizoids to the beat of the music. 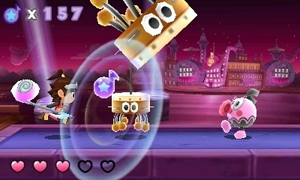 Combining platforming with rhythm-action, hit the jump and attack buttons in time with the music to clear the obstacles, collect all the gems and beat each stage. Every level has its own music track to play along to. You will also have to battle Noizoid bosses with time strikes before you can move on to the next world.